SABIC has been named a winner of the prestigious Crystal Cabin Award® in the category of Materials & Components at an award ceremony on April 14, 2015 in Hamburg, held in conjunction with the Aircraft Interiors Expo. SABIC was honored with the award for its CLEAR LEXAN XHR sheet series, the company’s inaugural entry into the only international competition for excellence in aircraft interior innovation, now in its ninth year. 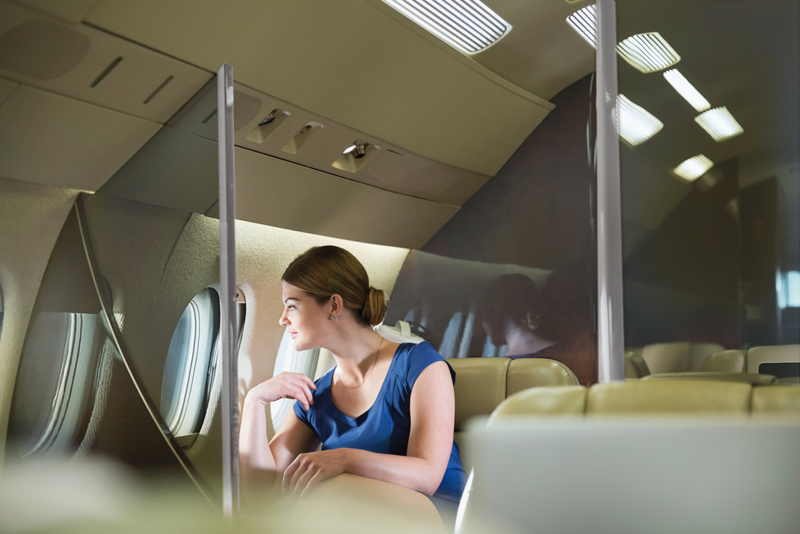 CLEAR LEXAN XHR sheet series, a lightweight engineered thermoplastic material, was developed in response to the airline industry’s ongoing desire for a transparent material that would help to differentiate cabin interior designs. This innovative solution offers the highest level of light transmission available in an OSU-compliant sheet material today, meeting OSU 65/65 heat release and typical industry flame, smoke, toxicity (FST) requirements (FAR25.853, BSS7239, ABD0031), expanding design options for window reveals, partitions, refrigeration equipment, luxury interiors, walls, security partitions, oversized windows, self-service refreshment stations, instrument displays, divider panels and mirrors. 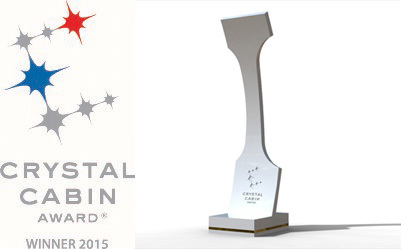 “SABIC is honored to be named a Crystal Cabin Award winner for 2015. The award is tremendous validation that our commitment to the aircraft industry – which to us, means listening to our customers and leveraging our global innovation expertise in response to their needs – is helping to solve industry challenges,” Kim Choate, Director of Mass Transportation for SABIC’s Innovative Plastics business, said. The Crystal Cabin Award seeks to spur the development of new products and innovative designs for aircraft cabin interiors, with the ultimate aim to create a significant improvement in passenger comfort. The competition drew a record number of participants, with 68 submissions. A total of 21 semifinalists were shortlisted, three each in seven different categories. Judging criteria included: unique/novel features of the entry; compatibility with general market demand; aesthetic and engineering qualities; usability and cost-effectiveness. As aircraft interior designers seek to achieve modern, light-filled cabin environments, they require a range of transparent materials that meet the industry’s vertical burn standards and are amenable to different processing technologies. 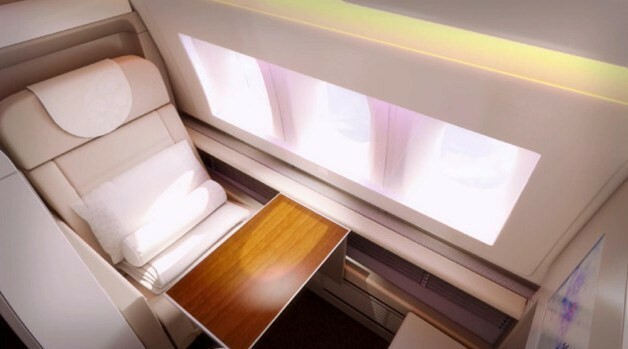 SABIC introduced its LEXAN XHR2000 sheet material for aircraft interiors last year, including two additional variations that come in one- or two-sided hard coat options, called CLEAR LEXAN XHR2HC1 and LEXAN XHR2HC2 sheets. With 80% light transmission, the innovative CLEAR LEXAN XHR2000 sheet is both durable and thermoformable, while complying with strict airline standards for fire, smoke and toxicity. With introduction of coated CLEAR LEXAN XHR2HC1 and LEXAN XHR2HC2 sheets, SABIC offers grades that provide even more robust vertical burn performance, reaching the industry’s highest standards without the need for secondary processing to apply a coating, laminate or film. These coated sheets meet the industry’s robust 60 second vertical burn performance, and the same smoke density OSU 65/65 heat release standards and OEM toxicity requirements as the uncoated LEXAN XHR2000 sheet. In addition, they provide chemical resistance and scratch resistance properties. LEXAN XHR2HC1 sheet, coated on one side, is a candidate for components that need to be laminated or printed. LEXAN XHR2HC2 sheet, coated on two sides, is a candidate for many of the same applications, offering scratch, chemical and graffiti resistance on both sides. SABIC showcased the products at the Aircraft Interiors Expo in Hamburg (14 – 16 April, 2015) Hall 7, booth # 7B70 and they were also displayed in the Crystal Cabin Award Gallery in Hall B6, Booth 6C10. For more information about the Crystal Cabin Award, visit www.crystal-cabin-award.com. SABIC’s CLEAR LEXAN™ XHR sheet, available as uncoated or coated options, provides aircraft interior designers with new options in transparency: 80% light transmission, the highest level of light transmission available in an OSU-compliant sheet material today which meets OSU 65/65 heat release and typical industry flame, smoke, toxicity (FST) requirements (FAR25.853). • High-resolution photos are available upon request. • Crystal Cabin Award® is a registered trademark of the CCA Association. Saudi Basic Industries Corporation (SABIC) ranks as the world’s second largest diversified chemical company. The company is among the world’s market leaders in the production of polyethylene, polypropylene and other advanced thermoplastics, glycols, methanol and fertilizers. SABIC recorded a net profit of SR 23.3 billion (US$ 6.2 billion) in 2014. Sales revenues for 2014 totaled SR 188.1 billion (US$ 50.2 billion). Total assets stood at SR 340 billion (US$ 90.7 billion) at the end of 2014. SABIC’s businesses are grouped into Chemicals, Polymers, Performance Chemicals, Fertilizers, Metals and Innovative Plastics. SABIC has significant research resources with 19 dedicated Technology & Innovation facilities in Saudi Arabia, the USA, the Netherlands, Spain, Japan, India, China and South Korea. The company operates in more than 45 countries across the world with around 40,000 employees worldwide.